-Earl Weaver, on Sammy Stewart’s first game. Bob Costas ran down a Rolodex worth of pitchers’ names during Stephen Strasburg’s debut in Washington this week in an effort to provide historical context. Jim Palmer was the only Oriole on the list. By the end of the night, Sammy Stewart’s name should’ve been mentioned as well. Stewart accomplished a rare baseball feat, one that Strasburg matched on Tuesday, by striking out seven consecutive batters during his rookie debut. The Sporting News ranked Strasburg’s consecutive strikeouts to end his outing first among the game’s “five most magical moments.” Far less magical is Stewart’s post-baseball life, which has been a tragic mix of drugs, crime, homelessness, and inevitably prison. But it wasn’t always so. 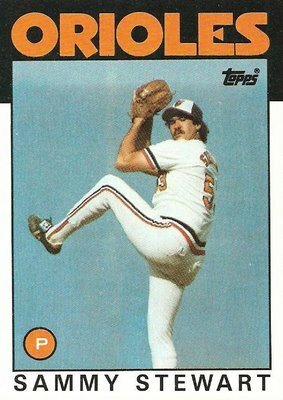 On Sept. 1, 1978, a 23-year-old Stewart established a new rookie record when he struck out seven straight White Sox batters. Overall, he had nine strikeouts in 5.1 innings of work as part of a 9-3 Orioles victory in a doubleheader sweep at Memorial Stadium. Until that night Spooner shared the record with fellow Dodgers pitcher Pete Richert, who tied the mark in 1962. Jim Deshaies later struck out eight consecutive batters as a rookie in 1986, but it wasn’t during his debut. Stewart stood alone atop the mountain. After a rough first inning that included a wild pitch and an error, Stewart settled down to strike out the side in the second and third innings. He struck out White Sox shortstop Greg Pryor to start the fourth before allowing fly ball outs to Mike Squires and Ron Blomberg. Overall, he retired 13 consecutive batters before allowing another hit. His fastball topped out at 94 MPH. Earl Weaver lifted Stewart after four consecutive one-out singles in the top of the sixth. Afterward, Stewart was succinct. “The most amazing thing was the velocity on his fastball, his poise, and the fact he threw strikes,” Earl Weaver added. Jim Palmer pitched seven solid innings for the Birds in the opener of the doubleheader before leaving with a stiff neck; Don Stanhouse finished off the 3-0 win. Palmer then coached Stewart on what to expect from the White Sox hitters in the nightcap. Having benefited from Palmer’s tutoring, Stewart returned to the clubhouse after the game to discover that his teammates had switched the nameplate above his locker with that of the three-time Cy Young winner. Stewart lost his second and final outing of the 1978 season to the Tigers on Sept. 29. He pitched in two World Series for the Orioles (1979 and 1983) and recorded six strikeouts in 7.2 innings of work.